Although I love makeup, I’ve never been a “stuff on my face” kind of girl. I hated foundation, avoided blush, never highlighted, and contouring was something that was not to be spoken of. So when BB and CC creams were first becoming a ‘thing’ here in the US, I totally blew it off. I hate stuff on my face, right? It feels weird. But not any more! Nowadays I’m getting a lot more interested in the idea of a product that can make my skin look brighter, fresher – and less red. And since I still don’t like feeling like I applied things on my face with a trowel, I need a simple and non-irritating way to get that effect. Turns out, cushions are just the ticket. So, because I like to shop, and because I went on a Memebox binge for a while, I’ve got five cushion compacts that have a foundation product in them. Three of them are BB cushions, and two of them are CC cushions. This post will be a brief overview of how they work, and how they compare to each other. First off, though, what the heck is a cushion? 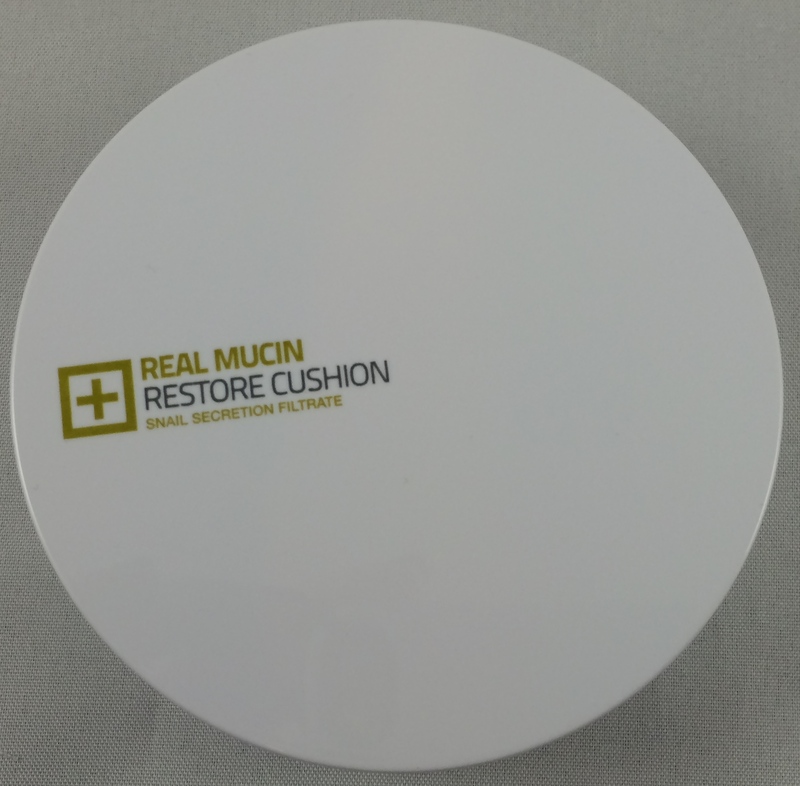 A cushion is basically a really thick compact that has a well built inside. In that well is a sponge that holds the BB or CC cream (or whatever else – there are cushions for blush and sunscreen and other products too). 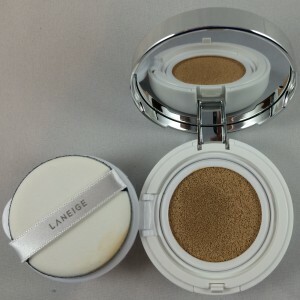 The idea is that the cream has a thin consistency, and the sponge aerates it even further, which gives you a lighter application and finish than you would get when using a regular foundation. In addition, the fact that the product is in a container that snaps closed means you can put it in your purse to reapply throughout the day without worrying about it spilling and ruining everything in your bag. According to AmorePacific’s US website, this cushion promises to protect against UVA and UVB rays (it has SPF 50 PA+++, although you should absolutely always wear sunscreen even if you are wearing products containing SPF, since you almost never apply enough to actually get that amount of coverage), fill in micro-lines, moisturize, cool and soothe, and brighten and protect your skin. I went into a brick and mortar store (Sephora) to purchase this, since I had a coupon. The nice makeup artist who was color matching me used the machine, pulled out the number, and retrieved the cushion – then she looked at the color the cushion and the color of my face and seemed a little distressed. Don’t worry – the product looks darker in the cushion than it applies in real life, and that holds true for most of these cushions. Here is a link with a list of the ingredients in the cushion. It comes in four shades: 104 Tan Blush, 106 Almond Blush, 204 Tan Gold, and 206 Amber Gold. The 04 shades are pinker, the 06 shades are more yellow, and the 100 shades are lighter than the 200 shades. This product is available at Sephora, Neiman Marcus and Nordstrom if you’re looking for a brick and mortar store where you can test the color matches, but can also be purchased from overseas via YesStyle and W2Beauty. Very classy and pretty, I think. The IOPE cushion also has SPF 50 and PA+++. The CC cream itself is formulated with mineral water, and IOPE claims that the inclusion of peptide extracts from Siberian botanicals and vitamin B5, vitamin E derivatives, and vitamin P will provide skincare benefits as well as minimizing the look of pores. Now, if you’re anything like me, you read that description and went “What? I’m pretty sure there’s no such thing as Vitamin P!” So I googled it. The first result that came up? Prozac. I’m pretty sure there’s no Prozac in this compact, so I’m going to assume it’s a simple translation error and that they probably meant Vitamin B instead. Here is a link to the ingredients in the cushion. Picking a color is where this cushion gets complicated. There are three types of coverage: Natural (sheer to light, denoted with an N), Cover (light to medium, denoted with a C), and Shimmer. Now, add in the skin tones. 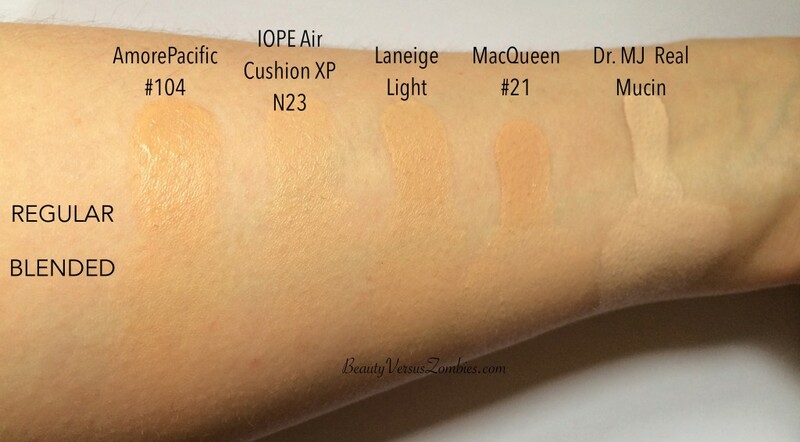 According to IOPE, there are only two skin tones in the world: Cool Vanilla and Cool Beige. Vanilla is more pink; Beige is more yellow. So if you’re yellow-toned and want coverage, you purchase C23; for a sheerer look you pick N23. For pinker tones, use C21 and N21. The shimmer color is its own special number: it’s just 22. 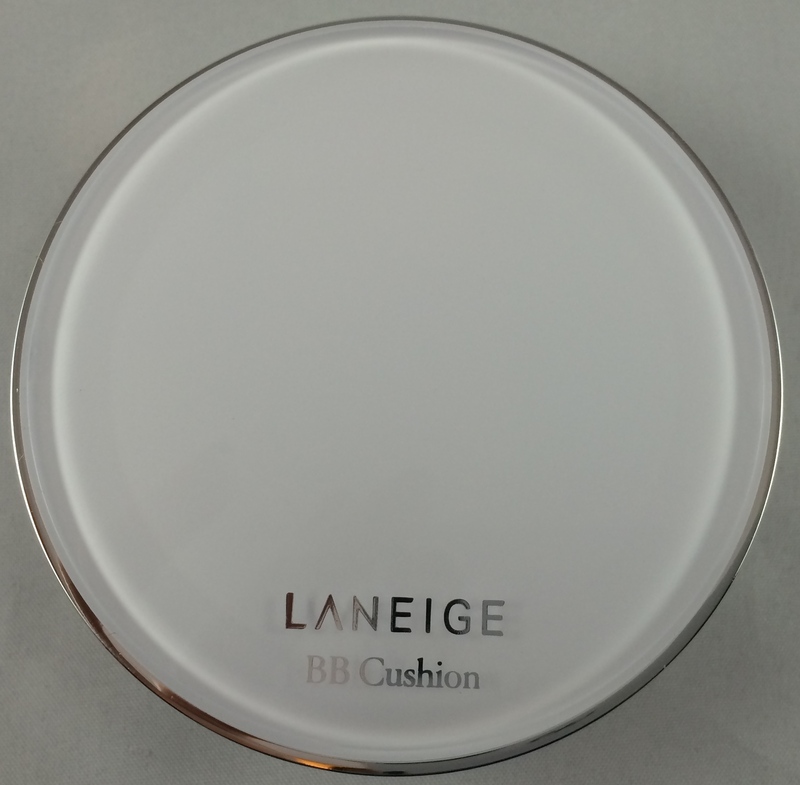 The Laneige BB cushion makes a lot of similar claims to the others – frankly, they all basically make the same claim. “Look like a celebrity! Fantastic dewy, pore-less, wrinkle-free skin!” Laneige attributes these results to the use of their Optimal Mineral Water. How their Optimal Mineral Water is better than the regular mineral water in the IOPE cushion I don’t know – and since Laneige and IOPE are both owned by AmorePacific the whole thing just becomes really confusing. Almost exactly the same as the IOPE. This product is available at Target, and an also be purchased overseas via YesStyle and Sasa. It comes in Light (this cushion), Medium (probably NC 30), and Dark (around NC50). Macqueen’s cushion is the other CC cushion in the bunch I’ve acquired. Macqueen is not, as far as I know, part of the AmorePacific line. This cushion is supposed to change color based on skin temperature to make it match you better. I have no idea what that means – does it blush with you? Weird. In any case, it’s also supposed to remove sebum, moisturize, cover pores and provide skin care. 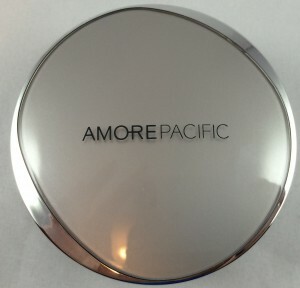 Not quite as “grown-up” looking as the compacts from AmorePacific, but it’s sturdy and gets the job done. That weird situation happening in the mirror is NOT because the mirror here is cheap and defective; I just forgot to remove the protective plastic coating. This cushion is available in two shades: 21 and 23. The cushion itself in this compact seemed like it didn’t fit super well – the cushion itself lifted a little when I pressed the applicator down, and I have concerns about a product where there’s a risk of the cushion coming out of the compact. Onsen-Sui, Glycerin, Cyclopentasiloxane, Titanium Dioxide, Cyclohexasiloxane, Mineral Water, CI 77492, Fragrance, Chamomilla Recutita (Matricaria) Flower Extract, Scutellaria Baicalensis Root Extract, Butylene Glycol, Alcohol Camellia Sinensis Leaf Extract, Polygonum Cuspidatum Root Extract, Rosmarinus Officinalis (Rosemary) Leaf Extract, Glycyrrhiza Glabra (Licorice) Root Extract, Triethoxycaprylylsilane, Sodium Hyaluronate, Aloe Barbadensis Leaf Extract Methylsilanol Mannuronate, Centella Asiatica Extract, CI 77499, Adenosine, BHT, Bambusa Vulgaris Sap Extract, Sodium Chloride, Sorbitan Sesquioleate, Phenoxyethanol, CI 77491, Methicone, Ethylhexyl Methoxycinnamate, Diisostearyl Malate, Zinc Oxide, Cyclomethicone, Caprylic/Capric Triglyceride, Arbutin, Cetyl PEG/PPG-10/1 Dimethicone, 4-Methylbenzylidene Camphor, PEG-10 Dimethicone. This mirror also has a protective coating on it – and it took me FAR too long to figure out how to remove it without damaging the mirror itself. The interesting thing about this cushion is that unlike all the others which seem to be set into the compact a little, this one rests a little bit higher. It feels bouncier, which I like, but the down side is that the bounciness makes it easier to take out too much product. This product only comes in one shade, too, which rules out like 90% of the world since it’s pretty pale, even for me. I couldn’t find an ingredient list, but it does claim to be free of paraben, mineral oil, talc, alcohol, and benzophenone, and to contain snail extract, adenosine, arbutin, allantoin, aloe extract, sea water, sea grape extract, collagen, ceramide 3, niacinimide, and macadamia seed oil. I could only find this on Memebox, Amazon, and KoreaDepart. So, now that we have the basics down, how do the products compare? It’s not really fair to compare BB creams to CC creams, so I’ll compare the BBs and then do the CCs separately. Remember: I’m somewhere between an N20 and an NC20. Here are swatches of all of them, so that you can compare colors a little at least. These were taken with a daylight bulb so they should be pretty accurate. The tops are just plain swatches of the foundations, straight from the cushions. The bottom is a vague attempt to blur them out. The swatch of the Dr. MJ isn’t blended so well because, like I said earlier, it’s really easy to over apply product with a raised cushion. So, the CC cushions. Color correction cushions provide, as the name would indicate, not a whole lot of coverage – just enough to really even out your skin tone and give you a nice finish. 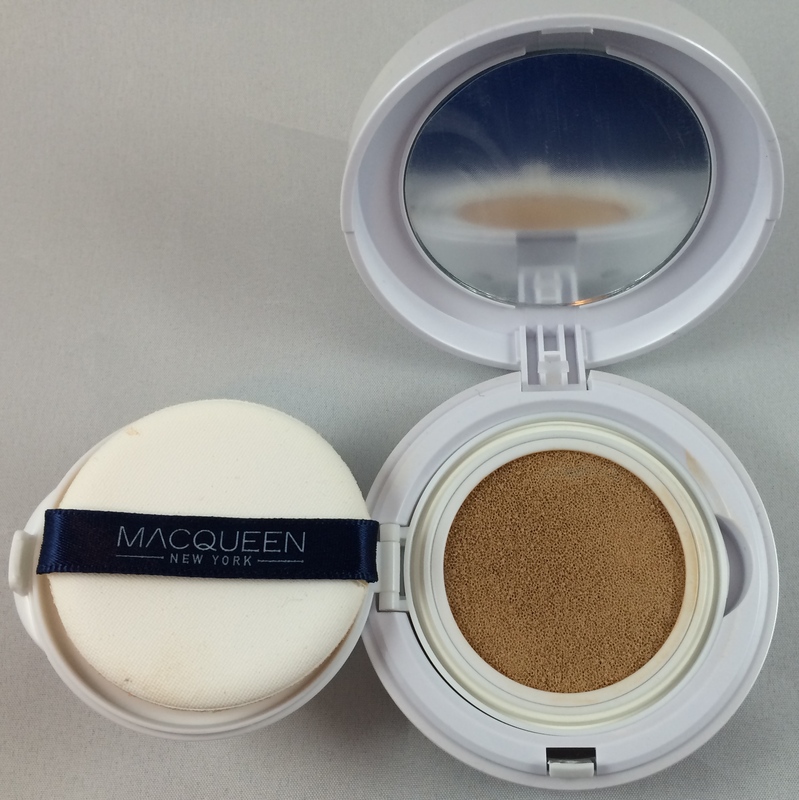 The MacQueen is a little darker than the AmorePacific cushion, but not a whole lot – and they both work fairly nicely on my skin. Since they are lighter coverage formulas, they look more natural and feel more comfortable on your face. The Macqueen seems like it has a little more coverage than the AmorePacific, but there really isn’t a huge amount of difference. They are both buildable – but not too much. If they are over applied, both products will create that ‘cakey’ look. 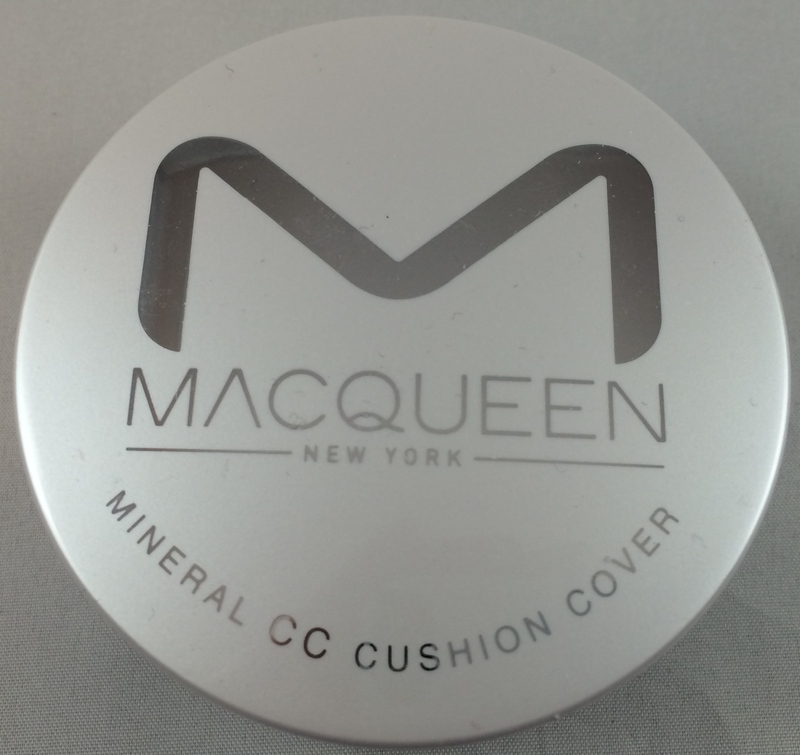 The MacQueen cushion, out of all the BBs and CCs, performed the best on the dry areas of my skin, so if you have dryer skin this is an option you should look into. The AmorePacific wasn’t bad per se on my dry areas but the MacQueen did very well. The AmorePacific formula applies a little bit dewier than the MacQueen formula. Both sit really nicely on my skin without emphasizing any imperfections. Both cushions seem to have a light fragrance. Now on to the BB cushions! 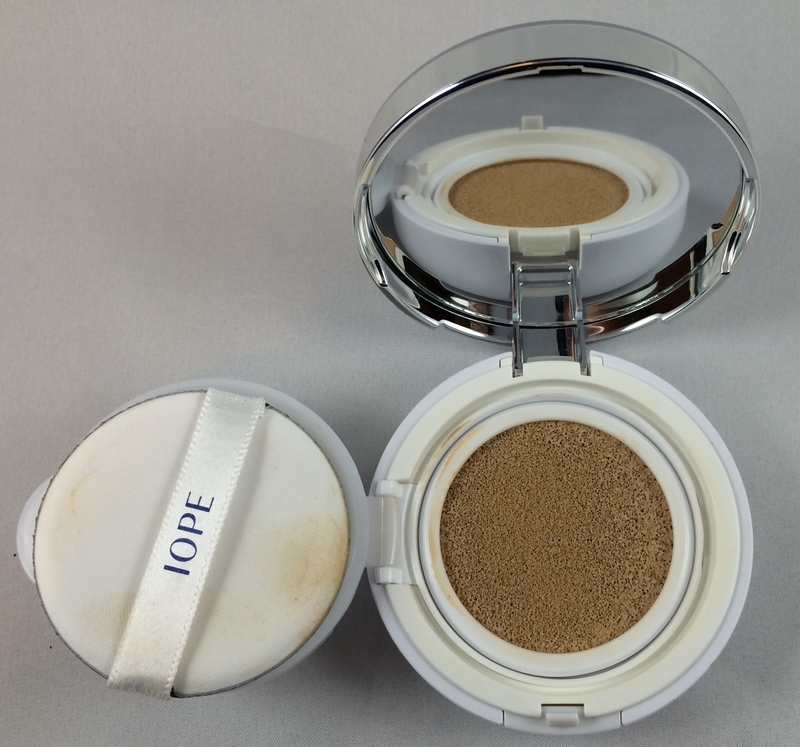 In terms of coverage, the IOPE and Laneige are roughly equal – light, buildable to medium. 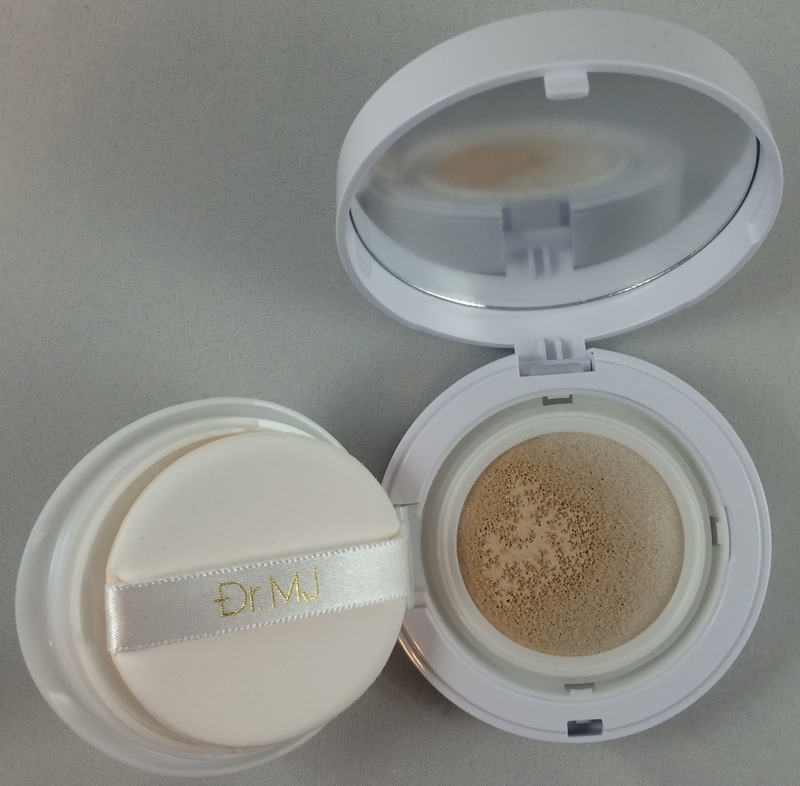 The Dr. MJ seems to have a little bit more coverage – again it’s harder to tell because it’s so easy to take out more product in comparison to the other cushions – but I also think that the formula is a little less smooth. 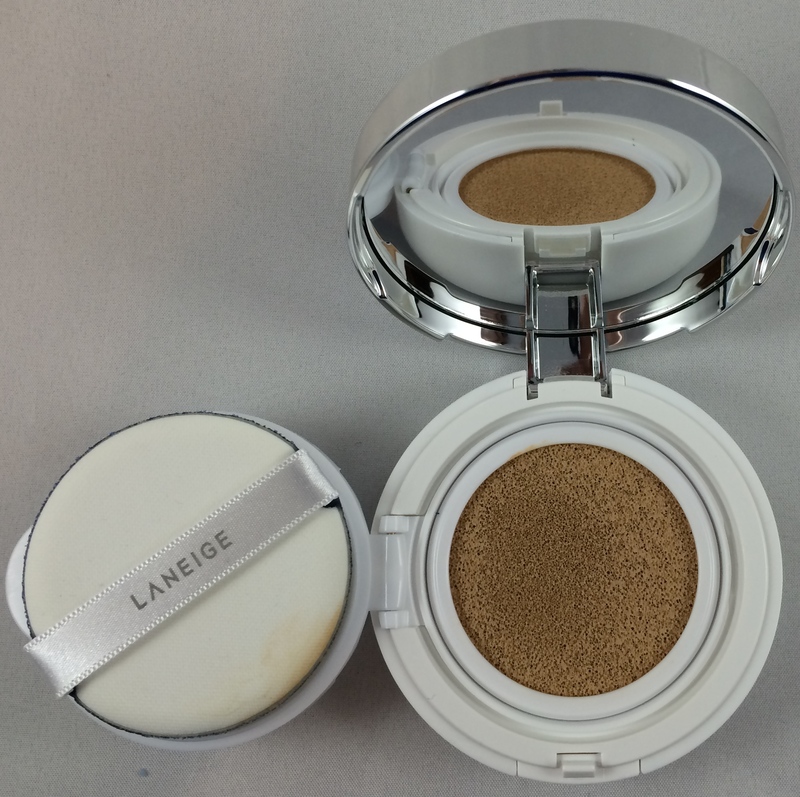 I did notice that it didn’t seem to sit as nicely on my skin as the IOPE and Laneige did. 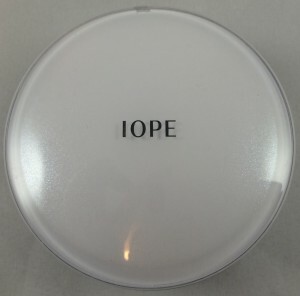 The IOPE seems to have a slightly dewier finish than the Laneige, but not enough that I would really use it as a reason to purchase one over the other – personally I would go with whichever was a better color match (if the fragrance issue didn’t already decide it for you). I also got a better “blur” effect in terms of any texture changes in my skin with the IOPE than with either of the others; the Dr. MJ seemed to emphasize any imperfections I had and the Laneige didn’t really seem to do anything either way. I absolutely would not use the Dr. MJ cushion if I had dry skin or any issues with flakiness or texture. Which cushion is my favorite? AmorePacific. I’m not looking for a lot of coverage, just enough to even out and get that ‘blur’ effect on my skin. AmorePacific has a great finish, is an okay color match for me, and is a better fit for my skin type, which is closer to oily than to dry. If I were using a product that dried my skin out, or if we were having a really horrible winter, that order might change. Of all the cushions, I will continue using the AmorePacific, the MacQueen, and the IOPE – but I will likely try to rehome the Dr. MJ and the Laneige. None of these cushions will work for me! One of the kind of strange and frustrating things about this cushion trend is that it hasn’t hit a ton of worldwide brands yet – so there’s generally a pretty limited selection of skin tones that can find a cushion product that works for them. Cushion products also almost universally try to provide that ‘dewy’ look, which may not be at the top of your list. Or hey, maybe you already have a foundation that is totally amazing the best ever OMG, but you’re curious to see how this cushion thing works. No worries! There are a few brands that sell empty cushion compacts, which means you get the compact with the well inside it, a sponge to go inside the well, and a puff for application. You can get them from Missha and A’Pieu, and put in whatever you want – whether that’s your favorite foundation, a sunscreen you need to reapply, or anything else! Like any other foundation product, these cushions will work better if you do a few things. First, make sure your skin is moisturized! It’s easier to apply anything to your skin when it’s properly cared for, and your application will be smoother. Finish your skincare routine, wait a minute, for it to set, and then start with your face makeup. Second, use a primer. Although you don’t necessarily need one unless you’re looking at a really long day to keep your makeup on your face, it helps to keep things in place if you’re oily, it can minimize the look of large pores, and it can make your makeup apply more smoothly. On top of that, there are also primers available that can counteract things like redness in the skin before you even put your foundation on, which means you can use a lighter formula and still get the same result. 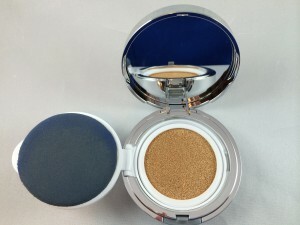 This entry was posted in AmorePacific, comparison, cushion, Dr. MJ, iope, Laneige, MacQueen, makeup, review and tagged AB Thunderdome, showdown by BeautyVersusZombies. Bookmark the permalink.